By using CnetSDK .NET PDF to Image Converter SDK, you can extract text from certain PDF page(s), and render & convert PDF document to txt file. This .NET PDF library component provides reliable .NET APIs and methods for you to quickly load PDF file from Stream Object and String Object, extract PDF text information from define PDF page(s), and convert whole PDF file to text file (.txt). PDF library component integration, text recognition & extraction, and PDF to text conversion can be easily and accurately implemented. CnetSDK .NET PDF to Text Converter SDK is fully compatible with .NET Framework 2.0 to 4.5, Windows System, Visual Studio 2005, and all above versions. It can be applied in Visual C#, Visual Basic .NET windows and web applications development. This PDF converter software is an independent .NET library for text extraction and PDF to text conversion. Adobe PDF readers or Acrobat SDKs are not required for your .NET projects. 1. Free to download .NET PDF to Text Converter & Extractor trial online. 2. Choose .NET PDF to text converter library dll based on your Windows System and .NET Framework. 3. Add CnetSDK.PDFtoText.Converter.Trial.dll to your VS .NET project reference. Integration is done. Please Note: if you are using CnetSDK .NET PDF to Text Converter SDK trial package, you can only extract text content from the first five PDF pages and convert it to txt file. We provide a demo project in the free trial package for your quick reference and evaluation. You may quickly start your .NET project by simply integrating CnetSDK .NET PDF Converter and Text Extractor library and using the following .NET APIs and methods. 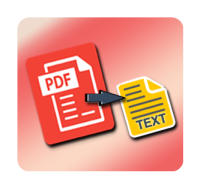 In this section, you will know how to load a PDF document, how to specify PDF page(s) for text extraction, and how to transform and convert whole PDF file to a txt file. The exported PDF text content can be saved in String Object for further search, archive or recycle. // Used to load a PDF file from a file stream or memory stream. // Used to load a PDF file from a local file on your disk. // Use to decide which page(s) to extract instead of entire PDF file. // Use to output text content to a String Object. // Used to render and convert entire PDF document to a txt file. If you want to add PDF to text converting and PDF text extracting features into your ASP.NET web application, you may refer to this online guide: How to Extract PDF Text and Convert PDF in ASP.NET Application. We also provide C# programming example for PDF text extraction and PDF to text file conversion. VB.NET programming example for PDF text extraction and PDF to text file conversion is also provided online.